Are you looking to become a trained referee? Maybe you're just looking for something to do to get involved in football. Either way, we can help here at Liverpool Homeless Football Club. We have a variety of funded training courses including this referee course that allows you to get involved in the game. Our courses are aimed at the homeless or people from a homeless background. This is not exclusive and there are other people who may qualify for the funded training. Our aim is to get people together who are socially excluded. We hope by bringing people together with football, we can get them out of their shell and improve their lives. We've already trained more than 200 people in courses such as first aid, football coaching and referee training. We don't provide the course directly, instead, they're ran in partnership with the Liverpool County FA who provide the training. They have a fantastic set of staff with huge experience in the game. Some of the trainers over there still have jobs at Everton FC and Liverpool FC so you know you're in good hands. If you want to apply then all you have to do is contact us. You can do that by visiting the contact page or calling us direct on 0151 237 3986 and one of our friendly staff will help you. If you're not applying for yourself don't worry, still get in contact and we will let you know what you need to do and if they're eligible. 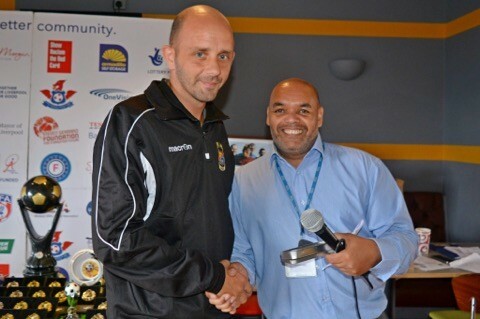 Craig aged 35 became involved with the club from the very beginning when due to family problems he became homeless.